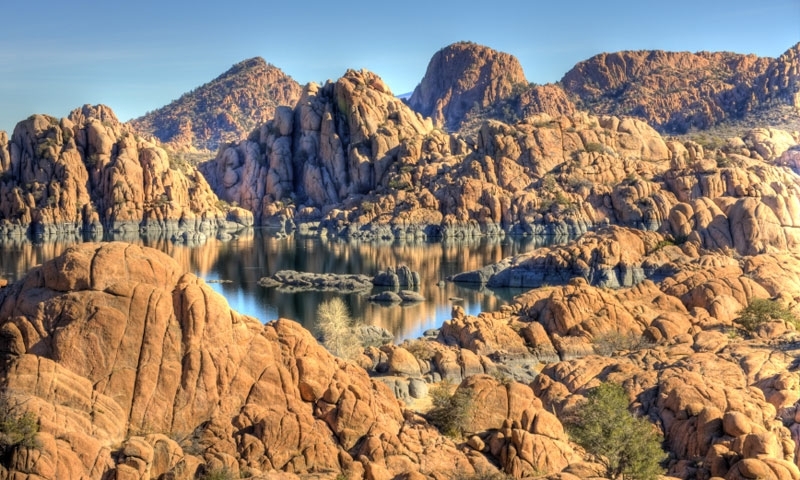 The Granite Dells are an amazing collection of granite boulder formations located about five miles away from downtown Prescott, near Willow and Watson Lakes. Located just minutes from downtown Prescott. See if you can find the buried treasure hidden somewhere within the Granite Dells! What can I see and do at the Granite Dells? Hiking: The locals believe that no matter how many times they set off across the terrain the dells sit on, they will never discover everything. For those who are slightly less adventurous than their rock-climbing counterparts will still feel rewarded, even keeping their feet on the ground. Indian ruins and artifacts are scattered through these parts as well. There are some reports of buried gold, too. Rock climbing: Not for the faint of heart, the Granite Dells provide excellent rock climbing opportunities, with their weathered, irregular shapes and sheer size. Kayaking: The Granite Dells lie adjacent to Watson Lake. Rent a kayak or canoe and see the Granite Dells from below, in the clear blue waters of the lake. Where are the Granite Dells? The Granite Dells surround Watson and Willow Lakes just outside of town. Head to the lakes and you’ll find the Granite Dells. There is no admission to visit the Granite Dells. Just park the vehicle and enjoy. Contact the City of Prescott at 928-777-1100.